It’s always hard to pick your favourite game of the year, especially when you get to play so many. Titles will rise and fall in your list and opinions will change over time. There were a lot of great games released in 2018…and a lot of bad ones too. 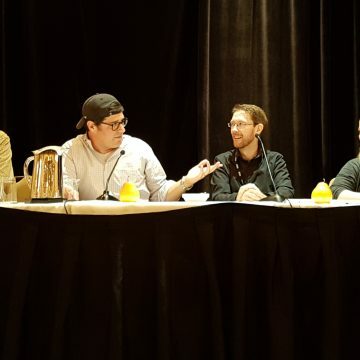 As long as the good titles keep coming and we continue to welcome new people to the hobby, the industry will be healthy and growing. 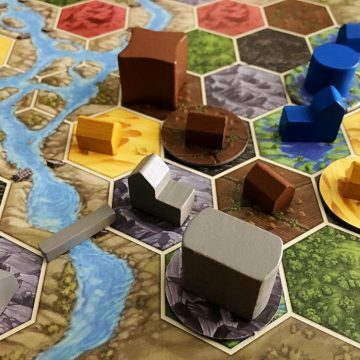 Whatever else is going on in the world, board games remain a way to escape and have fun with your friends. A lot of games could have been listed in this place. I’ll include some honorable mentions at the end of the article. This year I cheated a little bit, using a LATE 2017 release (although, I don’t know if it’s even seen a wide release in North America yet). I first got to try Mini Rails at The Gathering of Friends back in April and was lucky enough to grab the only copy off the prize table there. Since then, I’ve been able to introduce a number of different people to it with great results each time. 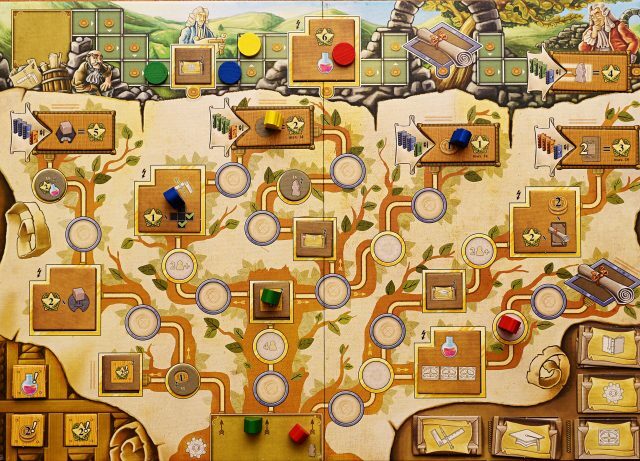 It’s not a crazy, deep strategy game, but it has something we talk a lot about when we review games: elegance. In Mini Rails, 3 to 5 players look to invest in different railroad companies and attempt to expand their network and raise their stock. 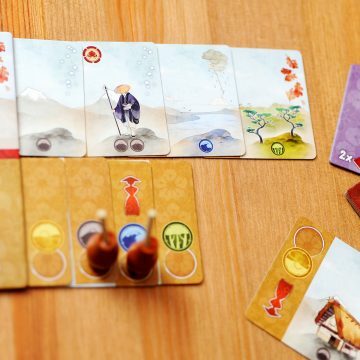 It’s played over six rounds with each player getting two turns a round. One turn will be spent buying stock, and the other adding to track on the board. 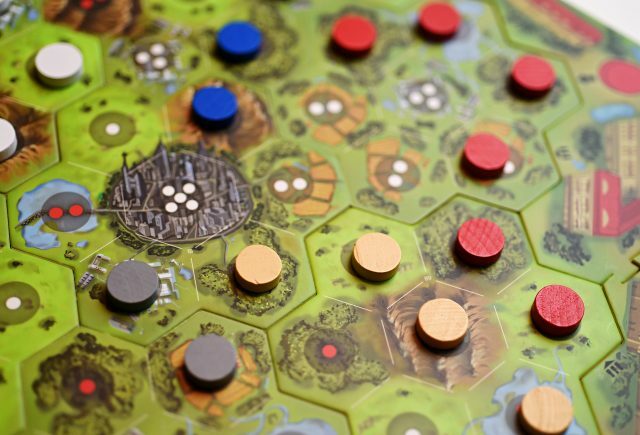 The main board in Mini Rails, is a bit reminiscent of a Catan board. There is an outside frame and modular double-sided tiles randomly make up the interior. 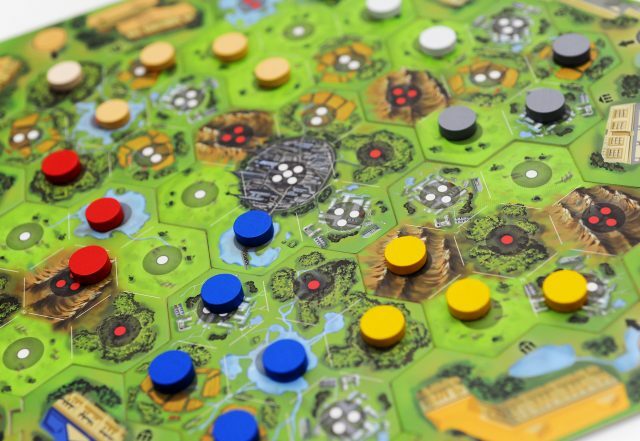 The Big City tile always makes up the centre of the board, but each other tile can be put in randomly. The different regions of the landscape on the main board either display white pips, indicating profit, or red pips, indicating loss. The Central Market board consists of the Order Track, the Market Track, and the Taxed Area. 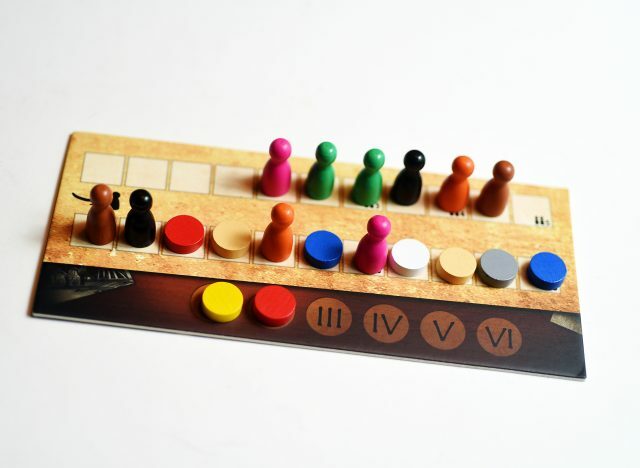 At the start of the game, players seed their order marker pawns on the Order Track, starting clockwise from the first player, then snaking back and ending with them, so they will get the first and last turn of the round. On the Market Track, coloured Train Company discs (which brilliantly work as both Track and Stock) are randomly laid out, one more than double the number of players. There are six different train companies in the game. Finally, each player gets a Profit board to track the rise and fall of the companies they invest in. In turn order, players move their pawns from the Order Track to the Market Track, selecting a coloured disc and either placing it on the ‘0’ space on their Profit board, thus investing in it, or placing it on the main board extending the rail line of that company and either adding to their profit, if placed on white pips, or their loss if placed or red pips. When track is added to the board, any player with that stock raises it or lowers it depending where the track ends up on the board. At the end of the road there will be one leftover disc. That moves down to the Taxed Area showing that it has paid its taxes. The Taxed Area also doubles as the round counter. All of the player pawns will have moved from the Order Track to the Market Track, but that simply forms the Order Track for the next round and the previous one becomes the Market Track. It’s one of the smart little design element that adds to my affection for this game. 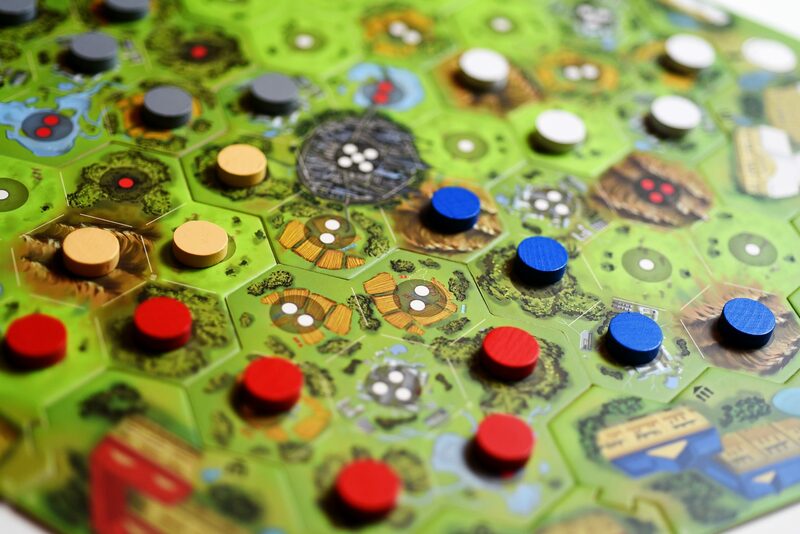 Round after round players will take turns buying stock and laying new track on the board. Alliances are formed as players invest in the same company and work to raise its value, but when a stock gets too high, it becomes a target for players to extend track onto red pips, taking them down a notch. It’s even possible for a stock to go into the negative, costing players end game points. After six rounds players count up the value of their stock, with the wealthiest player winning the game. However, only the companies that have paid taxes at least once during the game will count their positive value. Likewise, if a company has paid taxes during the game all negative value is forgiven. Turn order can be really important in the game. Going earlier in a round will give you more options on the company discs you take, but going last gives you more say in which companies pay taxes. You can invest heavily in a stock to see it not pay off if those taxes aren’t paid, and you can bet that if it’s a juicy pay off for you, other players aren’t going to want to see those taxes paid. 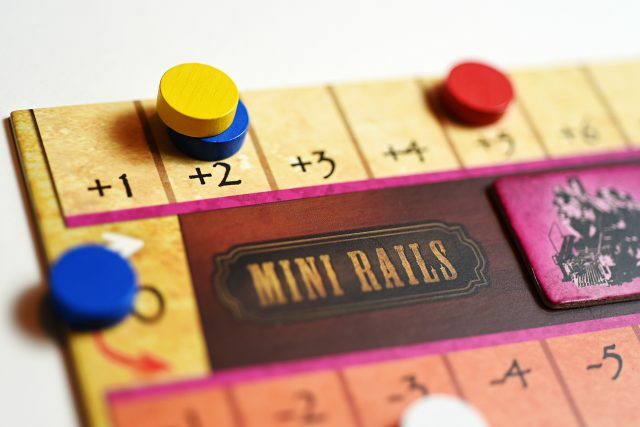 Due to its simplicity, Mini Rails plays in under an hour usually, even with five. Don’t let that playtime belie the interesting decisions you have to make. Depending on the lay of the board, you may see value in investing in one stock over another, but the fate of the companies relies on the actions of several players. There is a real social aspect to the game, as you jocky with the players you share interests with to advance your value and work against those you don’t. The art is pretty straight forward, and the components are nothing to write home about, but Mini Rails designed by Mark Gerrits and published by Moaideas Game Design is fun, interactive, highly replayable, and my favourite game of 2018. Coimbra: Super interesting use of dice drafting, where you have to consider your picks on a lot of different levels. An excellent strategic puzzle. Newton: Tight, tricky game that sees you trying to expand your knowledge by traveling Europe, studying, conducting experiments, and more. I’m terrible, but I love it. The Mind: Probably the game I played the most this year. Simple, cooperative game playing cards (hopefully) in ascending order with no communication. (Personal best: Level 11). 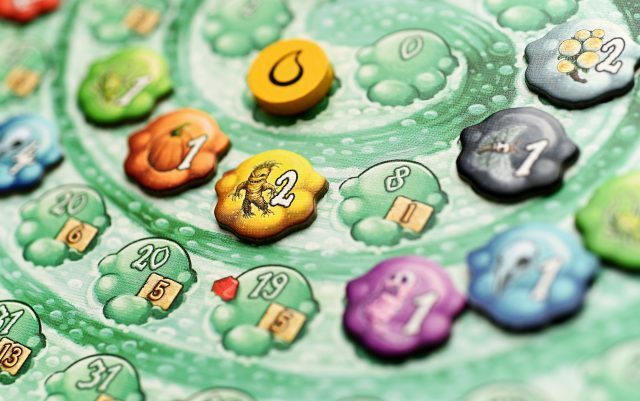 Quacks of Quedlingburg: Just pure fun push-your-luck gaming. I’ve tried a few different combinations of ingredient effects, but looking forward to more! Teotihuacan: Such a great rondel game. With so much variability between games, it’s highly replayable. Only two plays so far, but one I look forward to trying more. Decrypto: Fantastic party/communication game. Get inside the heads of your opponents and your teammates. Might have replaced Codenames for me. Did you guys try crown of emara ? This game flew under the radar and was a great Euro of 2018!